Give yourself just a little taste of the good life with the Luxe 220W Starter Kit by Vaporesso that is going to make you feel like you're part of the one percent. There is such a premium feel about this classically designed mod that gives you sophisticated style and innovative technology all in one. Your vaping sessions will be akin to a trip to a five star spa and you are going to end up walking away from them feeling so revived, rested that you'll wonder how you were able to get by with your old vaping hardware. Vaporesso creates some of the most top of the line, advanced vaping products that are going to make all of your craziest vaping routines come true in the snap of your fingers. The Luxe Starter Kit features an absolutely massive 8ml tank, a 2 inch screen, top fill capabilities and a quick, 2 hour charging time. 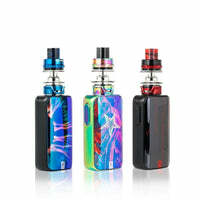 Luxe 220W Starter Kit - Vaporesso has a rating of 5.0 stars based on 6 reviews.